Brock Osweiler, also a standout basketball player, probably could have been a pretty good hockey defenseman. Nathan MacKinnon, who is not a quarterback, is wearing an assistant captain’s “A” this season for the Avalanche, and it’s another sign that, yes, the Colorado organization believes he’s ready for the mostly symbolic responsibility at age 22 and in his fifth NHL season. But there’s clearly more to it, going beyond the letter-less Matt Duchene’s strange and awkward situation, to the likelihood that this is another means of possibly prodding MacKinnon to get past what generally is perceived to be his maddening — if often flashy — underachievement. Although Gabe Landeskog, in his sixth season as captain, still is only 25, the younger MacKinnon more is in the same range as those brought in as the Avalanche committed to getting younger and faster. Avalanche coach Jared Bednar said the choice wasn’t difficult. 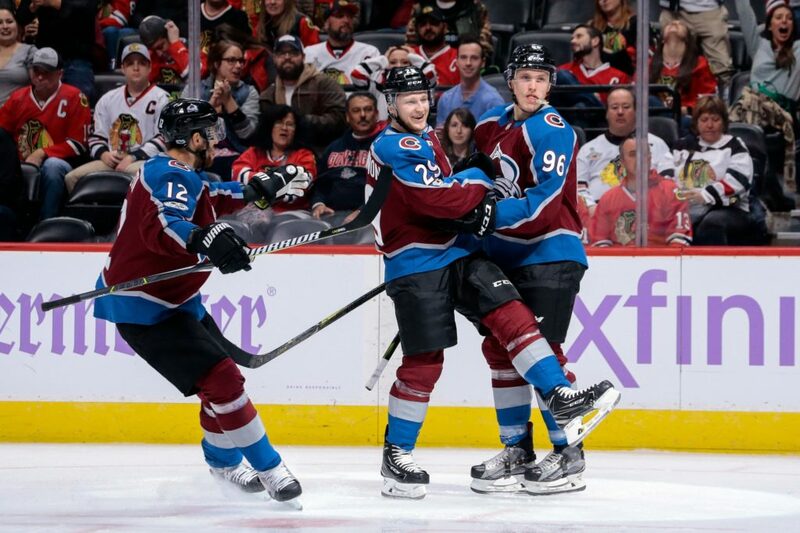 After scoring twice in the 6-3 Saturday win over Chicago, MacKinnon has three goals and five assists heading into the Thursday home game against Carolina. Until Saturday, he had only one goal in the first 10 games but his line — he’s now with Landeskog and Mikko Rantanen — was productive. Is he ever going to be great? Is he ever going to be worthy of mention in the same breath as phenoms Connor McDavid of Edmonton and Auston Matthews of Toronto, unless that mention is part of a rote listing of recent NHL top overall draft choices? McDavid and Matthews were billed as such spectacular prospects, it was tempting for teams to tank to improve their lottery chances at landing them — not that tanking would ever happen in the NHL. (Wink.) In fact, the Avalanche was so bad last season, nobody accused the organization of tanking before unlucky Colorado ended up with the fourth pick after the weighted lottery. MacKinnon was draft-eligible in a year when there was considerable debate over who should go No. 1, and the picks behind him were forwards Aleksander Barkov (Florida) and Jonathan Drouin (MacKinnon’s major junior linemate at Halifax who went to Tampa Bay); and then defenseman Seth Jones (Nashville). MacKinnon has one more career goal than Barkov (78-77). Drouin, now with Montreal, has 31 goals. Predictably, Jones, now with Columbus, took time to grow into the role of shutdown defenseman at the position with the more daunting transition from major junior or college to the NHL. At that point, the Avalanche wasn’t willing to be patient. And lastly, are MacKinnon’s moments of eye-popping speed and flashiness going to remain more tantalizing than they are confirmation that he’s on the verge of superstardom? When those moments come, as they often have, in international play at the World Cup (for 23-and-under Team North America) or the World Championships (for Canada), the talk — especially from our friends to the north, who also saw him star in major junior with the Mooseheads — is that he’s thisclose and the victim of sub-par talent around him with the Avalanche, rather than still far short. This might be the 30th time I’ve written about this, but it remains pertinent and one of the most significant issues tied to the Avalanche’s future. To his credit, MacKinnon never is offended when it comes up. It’s not that he’s been awful, or anything close to it. He won the Calder Trophy as rookie of the year in 2013-14, when the Avalanche stunningly piled up 112 points and he had 24 goals as an 18-year-old. Since, though, he has flat-lined … or worse. “There’s only one me, good or bad,” MacKinnon said Wednesday. “I’m not anybody else. I work really hard and I do a lot of things to get better. I’m improving and I felt like I really improved over the summer and I feel good. My mindset’s getting stronger as well. I’m still pretty young and I feel I have lots of growing to do. He said he looked at his success in international play through a prism of realism. “It’s two different leagues, I guess,” he said. “We’re playing Belarus and Kazakhstan and stuff, so it’s tough to compare. Bednar is the coach who would reap the benefits of a MacKinnon breakout season. Forget the No. 1 overall label for a second. It’s no guarantee, of course, and MacKinnon’s current teammate — Nail Yakupov, a washout at Edmonton and St. Louis now getting a last chance with Colorado after going at the top of the draft the year before MacKinnon — is proof of that. Erik Johnson, the No. 1 overall choice in 2006 with the Blues, hasn’t quite climbed into the stratosphere of NHL stardom, either, but is far and away the Avalanche’s top defenseman and is among the best of the league’s second tier on the blue line. But MacKinnon has shown those flashes. To a point, if you’re talented enough to get to the NHL, that’s close to inevitable. But these flashes are so tantalizing. And even so maddening. “The latter part of last season, I loved the way he was playing,” Bednar said. “He might not be putting up the numbers some people expect him to early this season, but he’s been playing well and you see what he could do, he took over the game the other night (against Chicago), him and his line, and led us to victory. The Avalanche needs him to be better than that.